If you want to maximize your odds of hitting the ebook bestseller lists at Barnes & Noble, ebook preorders via Smashwords are your ticket. 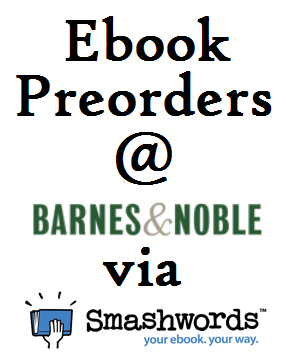 Most Smashwords authors who've done ebook preorders with Smashwords know that one of the many great advantages of a preorder is that accumulated preorders credit all at once at Apple and Kobo on the day the book goes onsale, causing the book to pop in the bestseller lists. What most authors don't know is that the same magical dynamic happens at Barnes & Noble as well. I didn't know this until today! If you're not incorporating preorders - and specifically B&N preorders - into your next book launch, you're missing out. In a nutshell, here's how the dynamic works at B&N, Apple and Kobo: Let's say your book is listed on preorder for 60 days in advance of your official onsale date. Let's say that at B&N (or iBooks or Kobo) your book accumulates 15 orders per day. After two months of order accumulation, you'd have 900 orders. These 900 orders would credit all at once on the first day when your book goes onsale. Since every retailer's bestseller charts are based upon unit sales, and all charts give greater weighting to sales credited during the most recent 24-hour period, it's like selling 900 copies in a single day. And that's before counting the additional sales that come once the book goes onsale. With 900+ sales at any retailer in a day, you're going to land near the top of your book's genre or category list, and probably also within the store's top-10 or top-20 store-wide bestseller list. You don't need to accumulate 900 orders to receive a boost from preorders. Even 10, 20 or 30 accumulated orders will give you an incremental discoverability advantage. By landing higher in the charts, your book becomes more visible and more desirable to readers who use the bestseller lists to discover their next read. And let's not forget the value of the permanent bragging rights that come when your book achieves bestseller status at multiple retailers. Ever since we announced preorder distribution last July to iBooks, B&N and Kobo, I mistakenly believed that B&N preorders didn't deliver the same first-day kick in the charts. I began to question my assumption last week when Nicky Charles' new preorder release, Betrayed: Book Two - The Road to Redemption, landed near the top of the charts at Barnes & Noble (she did the same at iBooks!). When I looked closely at the B&N sales reports, I noted that all her preorders credited on the first day. Earlier today I confirmed the behavior with our friends at B&N. Yay!! So there you have it. The day-one pop in the charts at B&N is confirmed. If you're not yet distributing preorders via Smashwords to B&N, iBooks and Kobo, plan now to do it with your next release. Multiple Smashwords authors have already hit the bestseller lists - and charted higher - thanks the added kick of preorders. Learn more about ebook preorders at http://smashwords.com/preorder, or in my ebook preorder strategy blog post and presentation, Hit the Ebook Bestseller Lists - A Guide to Ebook Preorder Strategy. Oh, we haven't announced this yet (well, I suppose I'm announcing it today!) - Once your preorder is loaded at Smashwords, you can now change the onsale date self-serve from your Smashwords Dashboard (thank you Daphne on the Smashwords engineering team!). Next Thursday May 15 at the RT Convention in New Orleans, and then again on May 31 at uPublishU in New York City, I'm presenting a workshop on ebook preorder strategy. I hope you can join us! In June I'll probably do a video on preorder strategy and add it to our collection of ebook publishing tutorials at YouTube. I'm getting closer and closer to trying this on one of my smaller new titles, so I'm glad you posted this update, thanks! Very good to know. Thank you, Mark! I'm using the pre-orders for my first book - Double Life - and I'm still waiting to see if/when my pre-orders are going to show up in my book stats. I know I've sold at least *one* book on iBooks (as I made the purchase myself). The other thing that's not being said is that how many people get 15 pre-orders a day? I'm probably averaging one...a week... and I've been marketing until the cow's come home. The other thing is that most of my readers are Kindle and/or print readers, so I can't tap that market until the book goes on sale. I was a believer in pre-orders, but I'm starting to waiver a bit until I see results. Hi Usher, there's a lot of room for us to improve on the sales reporting of preorders. Stay tuned on that. Most first-time authors aren't going to get 15 orders a day. But even if you can get one preorder every other day over a two month period, that's 30 orders hitting all at once, and that's enough to give you a boost in the charts. Your experience shows that preorders alone are not the silver bullet. They're a tool for incremental advantage. Most indie authors get ahead with incremental steps - one advantage here, one advantage there. View my strategy guide - you might find some additional promotion ideas as you approach launch. Do what you can and then get to work on the next book. Good luck! Mark - You're a peach. Love your interaction with your customers. Keep it up! My biggest issue is the delay between when sales happen and when they're reported. It's a bit disconcerting to see "orders through May 1st" and see that goose egg (unless all my friends are lying to me....totally possible too). Thanks for the service and advice - been consuming and using as much as I can! One note: the book did not show up for pre-order at Kobo, and actually is still not on their site. Since I don't really sell much through kobo, not a big worry to me, but worth mentioning that there may be a glitch somewhere. I used the Preorder with my book "The Mist King". Everything went fine and I am pleased except for Kobo who still hasn't put the book up. They have had it since Feb. and I know Smashwords resent it at least once. Kobo was running behind for awhile but this seems much too long. The Preorders are important and really help with sales numbers by dropping on release day. I will be using Preorder for my next book release "Bewreon" later this summer. Only concern will be Kobo having their issues fixed.